Chris Manson is an independent illustrator and comics creator based in Glasgow, Scotland. 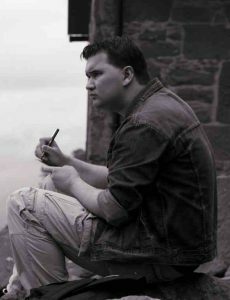 Born in Hong Kong to a mixed Scottish-Chinese family before moving to Glasgow, Chris displayed a keen interest in visual storytelling from a young age. Inspired by reading the works of Hergé, Goscinny et Uderzo, and Maekawa Takeshi, he began to write and illustrate stories of his own, often drawing from both speculative fiction and Chinese folk talkes as sources of influence. Academically, however, Chris took a more technical route – He originally trained as an Electrical and Electronic Engineer at the University of Strathclyde, graduating with merit as a Master of Engineering in 2010. Throughout university, he continued developing his visual storytelling skills through collaboration with similarly interested students. This culminated with the launch of his ongoing webcomic, Elf Blood, which continues today. After graduation, Chris moved to Manchester for work, where he became more aware and involved with the indie comics community through visiting the Travelling Man local comics store and attending the renowned Thought Bubble Festival. Here, he would join the Manchester Drink & Draw group, which brought him into contact with other independent comics creators. This would inspire him to publish more of his work, and to develop his craft more intensely. Chris moved back to Glasgow in 2014, where he continued to improve his skills through practice and classes, and started attending the Glasgow Drink & Draw group. He was contacted in 2015 by The Ferret, Scotland’s leading independent investigative journalism platform, to provide artwork for an important article. This was the beginning of a strong working relationship between Chris and The Ferret, which continues to the present. Chris continues to hone his craft and produce comics and illustration work – his current focus is expanding his brand through appearances at comic conventions.